The New York Knicks, believe it or not, are experiencing a winning streak following a 98-91 win over the Philadelphia 76ers. The Knicks still have the worst record in the NBA, worst than the Sixers, but maybe things are actually getting better? 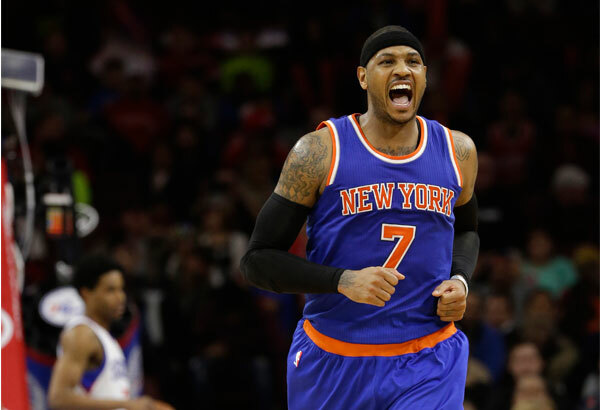 Carmelo Anthony isn’t a fan of tanking. No one is. But the thing about the Knicks is that they didn’t start out this season with the intention of tanking. The losses simply piled up, and there was no choice but to head in that direction. It doesn’t mean players aren’t trying to do their best. It simply means the front office doesn’t give them the best set of tools in their disposal to succeed. What they have besides Anthony isn’t much, but it’s still enough to look a bit better than embarrassing on some nights. In a bad game of basketball, with the Sixers shooting 36.7% from the field, the Knicks pulled through to improve their record to 7-36, now one win less than the Sixers with 8. Anthony scored 27 points, although he was highly inefficient when getting those points. He shot just 8-of-24 from the field, grabbing 11 rebounds. He got help from Jose Calderon with 15 points and Tim Hardaway Jr. scoring 13 off the bench. The Knicks have the fourth longest winning streak in the Eastern conference at the moment, so there’s that to be proud of. In a season with so few things happening to actually make the players feel happy about themselves not to mention the fans, who are split between those wanting to see the team do as well as possible and those that are in favor of tanking and improving their prospects heading into the next draft, a two-game winning streak is almost unheard of. Maybe they’ll have a full week of not losing? Michael Carter-Williams scored 27 points for the 76ers, although like Anthony, it wasn’t on the most efficient of terms (10-of-26 from the field). The Knicks didn’t shoot that much better than the Sixers, hitting only 40.7% of their shots. When the two worst teams in the NBA collide, it’s hard to expect better basketball than this.